New little addition to the family? Want a keepsake for a new baby, a gift maybe? 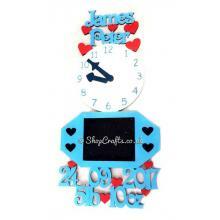 I have the perfect heart warming product for you, Our unique photo frame personlised baby clocks with Name, Time, Date and Weight. These are made to order so any colour is yours to pick. You can have it all painted, Half glitter half paint or all glitter. We provide a photo size guide so you can cut the correct size to fit. Measurements will vary depending on the personalised details.